Okkervil River (the project of Will Sheff and backing band) are releasing a new album, In the Rainbow Rain, on April 27 via ATO. Previously they shared the album's first single, "Don't Move Back to LA" (which was one of our Songs of the Week), as well as a strange and cinematic video for "Pulled Up the Ribbon" (which was also one of our Songs of the Week). Now they have shared a video for "Don't Move Back to LA." 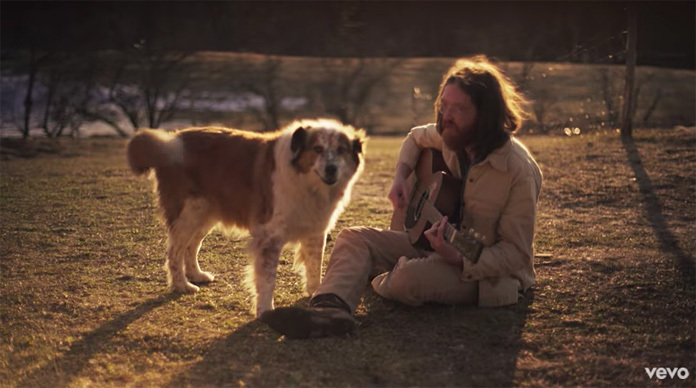 Sheff directed the video himself, which features him enjoying farm life, among other things. Watch it below, followed by the band's upcoming tour dates. Sheff self-produced In the Rainbow Rain, which was mixed by Shawn Everett (Perfume Genius, The War on Drugs). The album is the follow-up to 2016's Away. Sheff's backing band for In the Rainbow Rain is Benjamin Lazar Davis (bass), Will Graefe (guitar), Sarah Pedinotti (keys), and Cully Symington (percussion)-Sheff's band on the Away tour. Sheff reflected on that tour in a previous press release: "It was my favorite touring experience in many years... I felt like a kid again. I realized how phenomenally lucky I am that I've been able to play music for this long." Sheff began writing In the Rainbow Rain right after the 2016 Presidential election. "If December 2016 was good for anything, it was good for writing songs," he said in the previous press release. In the press release Sheff said previous single "Don't Move Back to LA" "had a very straightforward impulse behind it: a bunch of my best friends all moved to LA and I was really sad about it so I wrote a song about how I didn't want them to leave...I think the song is also kind of about my own deep and long-held desire to get the hell out of New York City." Pick up or download Under the Radar's Spring 2018 print issue to read our The End interview on endings and death with Okkervil River's Will Sheff.